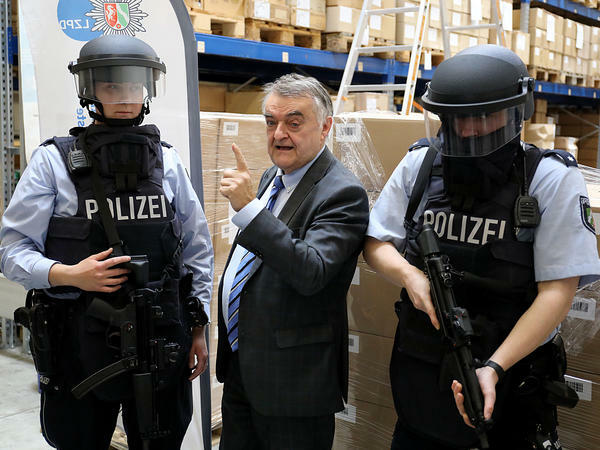 North Rhine-Westphalia's interior minister Herbert Reul, seen with police officers, apologized for mistakes that left a Syrian man falsely imprisoned and then dead when a fire broke out in the jail. The Syrian man — whose name was not released — bore little resemblance to a man from Mali, who was being sought by police for the fine. But the Malian man had used a pseudonym, so the two had the same name. In September, a fire broke out in the jail where the Syrian man was being held. Ten inmates suffered from smoke inhalation, and the Syrian received severe burns, according to German news agency DPA. He died two weeks later. Reul offered an apology to the man's family and said, "We must do everything so that a case like this is not repeated." Der Spiegel reported that the public prosecutor's office in the town of Kleve began an investigation of how officers came to arrest the Syrian. State Justice Minister Peter Biesenbach told the media, "We have to ask ourselves critically what went wrong, because what's certain is that something did go wrong." Germany was once a champion for Syrian asylum-seekers. Chancellor Angela Merkel welcomed thousands in 2015. After a widespread outcry, the government tightened its borders and policies. In June, Germany became the first country to take legal action against a Syrian official for crimes against humanity during Syria's civil war, according to Deutsche Welle. The federal prosecutor issued an international arrest warrant for Jamil Hassan, the head of the Syrian Air Force Intelligence. He was accused of ordering forces to "torture, murder and commit sexual crimes against hundreds of detainees in Syria."